We’d love your help. 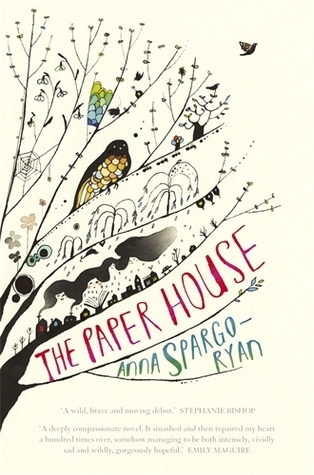 Let us know what’s wrong with this preview of The Paper House by Anna Spargo-Ryan. To ask other readers questions about The Paper House, please sign up. Could someone please explain Noel for me? In chapter 3, Dave gets a job in a school described as “fibreglass and modular”. Can a school be made of fibreglass? Heather and Dave are young, married and in love. After moving around a bit with Dave's job as a relief teacher, they are ready to start a family and escape to the country. It's all going well for them - until it isn't. This is the debut novel for Anna Spargo-Ryan, who writes beautifully and powerfully about mental illness. It's a subject I wish I understood better, because if I did, it might have occurred to me a lot sooner to start questioning what in the story was real and what wasn't. Don't ge Heather and Dave are young, married and in love. After moving around a bit with Dave's job as a relief teacher, they are ready to start a family and escape to the country. It's all going well for them - until it isn't. This is the debut novel for Anna Spargo-Ryan, who writes beautifully and powerfully about mental illness. It's a subject I wish I understood better, because if I did, it might have occurred to me a lot sooner to start questioning what in the story was real and what wasn't. Don't get me wrong, the obvious things - like what was happening at the bottom of the garden - were obvious, but towards the end it dawned on me that there was probably a lot more that I should have picked up on. Wow this woman can write! Her proze is gobsmackingly beautiful. I wanted to fall into her writing forever. The only thing I craved was more of a plot line. Can't wait to see what she writes next. I am a definite fan. I started reading this novel with some trepidation, because I've read Anna's short stories and articles before. I'd built some expectations and what if they weren't met? So I tried staying a bit detached but couldn't for long - this story drew me in. From the early stages, where life for Heather and Dave was rolling out as it should, to the devastation of a life lost, and the way everyone tried to make sense, to work out how to be within this new world - the afterwards - the storyline was grippi I started reading this novel with some trepidation, because I've read Anna's short stories and articles before. I'd built some expectations and what if they weren't met? So I tried staying a bit detached but couldn't for long - this story drew me in. From the early stages, where life for Heather and Dave was rolling out as it should, to the devastation of a life lost, and the way everyone tried to make sense, to work out how to be within this new world - the afterwards - the storyline was gripping. Then the way Anna structured her story, the way she coloured it with the beauty of the everyday things, the way she captured the interactions between the main characters (both verbally and in their actions - the things they did and didn't do), and the way she let it all unfold naturally, was just so - right. All the characters were whole beings, with flaws and with oddities, and with lovely attributes. Real people. It really is one of those rare books which is true to life, except expressed in a way most of us would struggle to capture in words. The way that Anna moved between Heather's childhood and the current day, to show how the past is relevant, was very sensitively done, and not overworked. Sometimes you need to read a book like this to help you make sense of what you have experienced - whether the same circumstance, or something similar. And this is one of those wonderful books which manages to do this so very well. Plus - it is set in one of my most favourite places in the world, around the Mornington Peninsula and surrounds. Just to top it off. One of the most touching, heartfelt novels I've had the joy of reading in quite some time. Occasionally I read a book that reaches deep inside and turns me inside out. A truly wonderful, wondrous, real, unreal, touching and thoughtful story. I can't recommended it any more highly. I wish I could wrap myself in the poetry of this book. It is exquisitely written - so many sentences I could live in - and the story is desperately sad, but also somehow hopeful. A really beautiful read. The Paper House is written with the same beauty as The Bell Jar. This book took me longer to read than expected because every single sentence deserves a pause of appreciation. Every now and then, a very special book comes along. A book that stands out from the crowd with a unique voice, heart-filled story and stunningly beautiful prose. The Paper House is one of those books. Anna tells a story that is both heartwarming and heartbreaking, with a gentle tenderness that is evident in every word on the page. Dealing with issues such as mental illness, childloss and the intricacies of family isn't an easy task, yet Anna does so with a delicate, empathetic hand allowing the Every now and then, a very special book comes along. A book that stands out from the crowd with a unique voice, heart-filled story and stunningly beautiful prose. The Paper House is one of those books. Anna tells a story that is both heartwarming and heartbreaking, with a gentle tenderness that is evident in every word on the page. Dealing with issues such as mental illness, childloss and the intricacies of family isn't an easy task, yet Anna does so with a delicate, empathetic hand allowing the reader to feel along with the characters every step of the way. What could well have been a tragic, depressing tale, is told so poetically, so touchingly that you will be compelled to turn the page and imagine yourself sitting, breathing with Heather and Dave. And by book's end, you will be left with a lingering memory of the characters and a hope for their future. A stand out novel, and one that will stay with me for a long, long time. Heather has suffered an unspeakable and utterly devastating loss, and the cadendece and rhythm of Anna's words makes you FEEL everything that is happening in her heart and her soul. It honestly hurt to read this book. My chest is tightening up even as I think about it to write this.... And I know am incredibly privileged to have experienced that. Highly recommended but would note it is not suitable if you just want a light little casual read. A beautiful, poetic novel of grief and family. The writing is spirited and evocative. I was in that garden with Heather, her pain was palpable. There was so much insight and understanding here, it was heartbreaking yet hopeful. I adored this, an incredible debut. I can't wait to read whatever Anna writes next. Anna's writing makes my heart hurt. Do not read while wearing mascara. Wow - if that is her debut I look forward to her next novel. This story was so well written and oh so sad. STANDING OVATION! For the author, for her brilliant writing, for her original, creative metaphors. BRILLIANT. My eyes welled up by page 8 and by page 10 I was crying. The story - as sad it is, with characters trying to manage loss, depression, and mental illness - is one of hope. I was captivated at every page turn through to the end, where I read with tears streaming from my eyes and nose. The author's 'OTHER THINGS OF NOTE' is a lovely afterword that gives further closure to the story. This qu STANDING OVATION! For the author, for her brilliant writing, for her original, creative metaphors. BRILLIANT. My eyes welled up by page 8 and by page 10 I was crying. The story - as sad it is, with characters trying to manage loss, depression, and mental illness - is one of hope. I was captivated at every page turn through to the end, where I read with tears streaming from my eyes and nose. The author's 'OTHER THINGS OF NOTE' is a lovely afterword that gives further closure to the story. This quote stood out for me as I came across it. It turned out to be very central to the story. Not since Ray Bradbury's Dandelion Wine have I been moved by such beautiful writing. Now...on a not so good note. This is a debut novel so I believe it would have gone through a stringent editing process. However there is a major error on Page 73 that has been overlooked. This review has been hidden because it contains spoilers. To view it, click here. I started reading this at lunchtime yesterday. I was 2/3 through this morning at breakfast I said to my partner "gosh Anna's book is good. Seriously good. Everyone on Twitter keeps saying they cried. I wonder if I haven't cried because I don't have that desire to have a family that other women do? I've haven't grieved like the main character, Heather, but it feels like she's exactly describing my own experiences of anxiety, depression and losing touch with reality. There isn't a man living in ou I started reading this at lunchtime yesterday. I was 2/3 through this morning at breakfast I said to my partner "gosh Anna's book is good. Seriously good. Everyone on Twitter keeps saying they cried. I wonder if I haven't cried because I don't have that desire to have a family that other women do? I've haven't grieved like the main character, Heather, but it feels like she's exactly describing my own experiences of anxiety, depression and losing touch with reality. There isn't a man living in our garden, is there?". And just now (lunchtime today) I have finished the Paper House and my face is wet. There's some kind of leaking issue with my eye holes and my nose holes. This book is heart wrenching, gut twisting, sob inducing brilliance. The prose is exquisite, and the story amazing, but most importantly, the characters are delicately built but utterly complete. It would have been so easy to add one, or a hundred cliches in this book - there are none. Read this. Then make everyone you know read it. A heartbreaking story of grief, and the way things reverbrate across generations. Spargo-Ryan writes beautifully, with surprising metaphors and a knack for drawing whole characters with just a few well chosen scenes. This is an incredible book. It drifts seamlessly from real to unreal until the reader is left questioning everything. A devastatingly beautiful read with vivid imagery and relatable characters, this was an absolute joy to read. Can't wait for more from Anna Spargo-Ryan. This is a superbly written debut, swollen with rich prose and gentle sentiment. The steady tide of tragedy was delicately handled, but for me this book was too slow to truly sweep me away. I teared up a little on the final page. Beautifully written book with an elegant and simple storyline that drifts between present, past and fantasy. As a Melbournian I also appreciated the local flavour. While it was beautiful, I'm not sure I would read it again. I found the portrayal of the men/women, carer/cared-for dynamics a little bit off and odd. All of the main female characters in this book (Heather, Fleur, their mum and Sylvia) are all cared for as a focus of the novel (i.e. we only int I teared up a little on the final page. Beautifully written book with an elegant and simple storyline that drifts between present, past and fantasy. As a Melbournian I also appreciated the local flavour. While it was beautiful, I'm not sure I would read it again. I found the portrayal of the men/women, carer/cared-for dynamics a little bit off and odd. All of the main female characters in this book (Heather, Fleur, their mum and Sylvia) are all cared for as a focus of the novel (i.e. we only interact with these women when they require care), and men are their primary carers, either as sons, husbands, fathers or lovers. I found this divide between what the men in the book were doing and what the women were doing to be really harsh and confronting, and I don't think it reflected that well on the ability of these women to have agency or be complex people. Normally in a book, I am fine with a few characters being the same, but here it seemed overwhelming without a counterpoint/contrasting character or two. I'm a notoriously slow reader. It usually takes me a few weeks to read a book, but I read Anna Spargo-Ryan's debut novel, The Paper House, in 7days; that's speed-reading for me. You would think a book that tells the story of a woman falling into a spiral of anxiety, depression, and mental illness after her daughter is still-born would be a dark, bleak, impossible read, but The Paper House is almost the opposite. The subject matter is dark, but Anna's use of language is remarkable and playful, the I'm a notoriously slow reader. It usually takes me a few weeks to read a book, but I read Anna Spargo-Ryan's debut novel, The Paper House, in 7days; that's speed-reading for me. You would think a book that tells the story of a woman falling into a spiral of anxiety, depression, and mental illness after her daughter is still-born would be a dark, bleak, impossible read, but The Paper House is almost the opposite. The subject matter is dark, but Anna's use of language is remarkable and playful, the characters are real and engaging, and the story is full of wonder, humour, and pathos. I really can't say more than that, except to say that it's a must-read. Believe the hype. It really is that good! It's been a few months since I've breezed through a book the way I did The Paper House, and gosh it's a great feeling. I felt completely swept up by this story, which is, to be frank, a bone-achingly sad one, but which Anna Spargo-Ryan paints with the most beautiful, fluid prose such that it is a true joy to read. Beautifully written and filled with genuine and real characters, this book made me reflect a lot of my own struggles with depression and those of the people close to me. It's a well-written journey that manages to make you smile as it pulls you down with the main character. Very highly recommended. You can read my review of this title at The Newtown Review of Books. Anna Spargo-Ryan is an award-winning Melbourne writer. She is the author of THE PAPER HOUSE (Picador 2016) and THE GULF (Picador 2017). Anna won the 2016 Horne Prize for her essay "The Suicide Gene". You can find her other work in Best Australian Essays, Kill Your Darlings, Meanjin, Overland, The Lifted Brow, Seizure, The Guardian, The Big Issue, and many other places.